Second Lieutenant Harold Parry (King’s Royal Rifle Corps) is killed by a shell at age 20. He was the Queen’s Prizeman of Queen Mary’s School and the author of Letters and Poems which will be published by W H Smith & Son, Walsall in 1918. He is considered one of England’s Great War Poets. 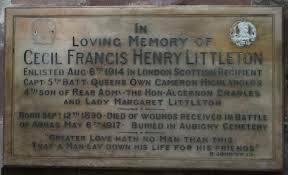 Captain Cecil Francis Henry Littleton (Cameron Highlanders) dies of wounds received in action three days prior at age 26. He is the son of Rear Admiral ‘the Honorable’ Algernon Charles and the Lady Margaret Littleton and grandson of the 2nd Baron Hatherton. Lieutenant David Clutterbuck (Royal Field Artillery) is killed at age 26. He is the grandson of the Reverend Charles Hall Raikes. Second Lieutenant Charles James V Sandford (Middlesex Regiment) is killed at age 44. He left “The Glad Eye” company to join the forces. Second Lieutenant Frank Paul Callinan (Australian Field Artillery) dies of wounds at age 22. His brother will die of wounds in September 1918. Sergeant Bertram Joseph Johnson (Royal Field Artillery) dies of wounds at age 28. His father will die on service as an instructor next July. Lance Corporal Herbert Frederick Hearle (Australian Machine Gun Corps) is killed at age 24. His brother was killed in April 1915. Private Sinclair Sutherland (Australian Infantry) is killed in action at age 24. His brother will be killed in September of this year. Private Cecil Garnett Stiff (New Brunswick Regiment) is killed at age 31. His brother will die of rheumatic fever on service next December.